Presenting the stunningly curated Studio Cyprus Rope Outdoor Furniture Collection; its sophistication will immediately upgrade your outdoor living space to a luxurious oasis. 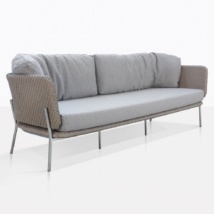 The design has a European flavor with its contemporary frame and impeccable rope weave. Each piece is topped with two Sunbrella® cushions that are uniquely designed and tailored to fit these pieces seamlessly. The bottom cushion is nice and firm while the back cushion is thick, soft and extra comfy. It’s the perfect balance for a high-end furniture collection. Be excited to host a proper cocktail hour in your outdoor space with these fantastic pieces. 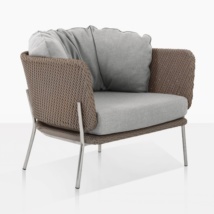 Your guests will love lounging on the Studio Cyprus Rope Outdoor Furniture Collection whether they are dressed in their finest or casual clothes. The collection features a large club chair and three seat sofa. We love pairing the Studio pieces with our outdoor concrete coffee and end tables. All deep seating products are sold separately so that you can select and purchase exactly what you need! Choose 2 relaxing chairs for your balcony, or place two sofas opposite each other for a cozy gathering space. Please call us today or request a quote online!